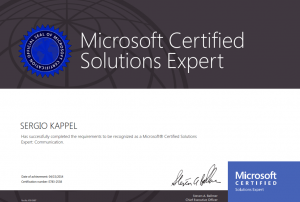 Last week I had the opportunity to sit down for the 70-337 (Enterprise Voice & Online Services with Microsoft Lync Server 2013) exam. Passing this exam will reward you with the MCSE: Communication title. Little is known on how to study for this exam. In this blog post I want to share my experience on how to prepare for this exam. 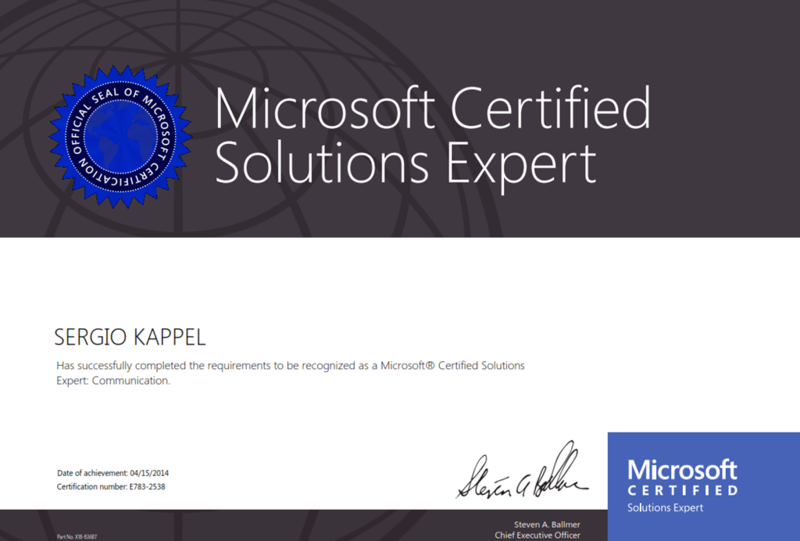 At http://www.microsoft.com/learning/en-us/mcse-communication-certification.aspx you can read what skills will be measured. By reading this first you will have better understanding about the technical skills that will be tested. This exam is all about voice. Voice, voice, voice, that’s the motto for this exam. covers about 90% of the skills that will be tested on exam day. Plan a weekend to go through all those videos. You will be rewarded with knowledge. This step is highly recommended, if you have the computing resources to run virtual machines to build a Lync 2013 environment. I have at home a modest lab environment were I can test everything regarding Unified Communications and specially Lync 2013. I highly recommend to buy a Lync Phone Edition desktop phone. A Polycom CX500 Desktop IP Phone can be bought for as little as $50 at Ebay. This will help you understand how a certified Lync Phone works with Lync Server 2013 and how each audio codec sounds in real life. When you feel confident with your newly acquired knowledge, you can register for the 70-337 exam at your nearest Prometric Test Center. This is a straightforward action. Tip: Grab a free second shot voucher. With this voucher, you will receive 20% discount on your exam fee. Should you fail to pass the 70-337 exam, you will have a second chance to pass this exam at no additional cost. On exam day you will have the chance to prove yourself and your employer that you have the necessary skills to implement enterprise voice using Microsoft Lync Server 2013. Due to the NDA disclosure that I signed, I can’t reveal any specific details about the exam. My journey towards this certification was a rocky one. Back in 2013 I have heard about Lync and I wasn’t that interested in real time communications. My old employer decided to introduce Lync into the organisation. I had the pleasure to administrate this environment. By tinkering around with Lync Server 2010 / Lync Server 2013, something amazing happened. I was triggered to know more about Lync, because I had the responsibility to keep real time communication infrastructure up and running. You may be thinking, what’s the point going all the way to achieve this MCSE title? The answer is simple: Unified Communications based on Microsoft products is hot. The world needs UC specialists to implement and to manage these environments. The magic quadrant for Unified Communications from Gartner, shows that Microsoft is a leader in this market. You can read the research here. Unified Communications is here to stay and the market needs highly trained professionals that understands the UC ecosystem, specially Lync. If you don’t want to miss the opportunity to boost your career, start now towards your MCSE: Communication certification. Your boss will thank you later for it.